The final series of Star Trek: Enterprise finished in 2005. For the next five years the show would be mothballed and we wouldn't see another new series of the franchise being produced despite the demand. Instead, we Trekkies had to satisfy our Trek needs with the various other pieces of media such as books and comics, not to mention what watching the series either on DVDs or repeats on television. 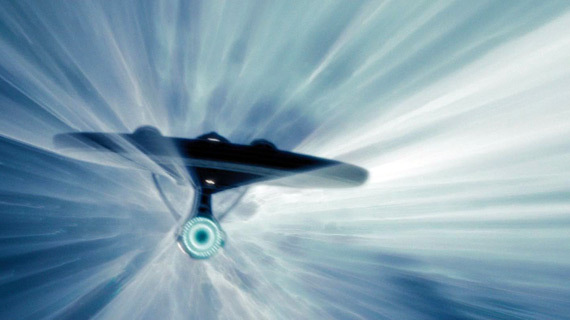 Then in 2009, something amazing happened for the first time since 2002, Star Trek would be returning to the big screen! But there were some concerns, rather than featuring a crew that we recognised, the franchise would be rebooted and we would see new actors in the roles of long loved characters. Producer and creator, J.J. Abrams settled for the crew from The Original Series and we saw Kirk, Spock, McCoy, Scotty, Uhura, Chekov and Sulu come back. When the film was released all worries were set aside, the story was set in a new universe, created by a black hole that a surviving Romulan ship passes through. It wants to stop the destruction of Romulus and comes across a ship that is manned by Captain Kirk's father. Unlike the television series, Kirk's father is killed in the resulting battle, while is wife and Kirk's mother, escape in a shuttle pod. One thing that was defiantly different about the reboot was that it didn't focus too much on human factors such as good or evil but instead plummeted for full out action. And the movie is all the better for it. Modern audiences weren't going to sit through old Star Trek kind of stories. What is interesting is that the movie begins with us seeing the different lives led by the child, Kirk and Spock. Kirk grows up into the hot-headed Iowa townie played brilliantly by Chris Pine while Spock is bullied at his school on Vulcan for being of mixed race, his father is a Vulcan while his mother is Human. Played superbly by Zachary Quinto, Spock joins Starfleet out of spite and that decision brings him into conflict with Kirk. We also get to meet the familiar faces of McCoy (Karl Urban), Uhura (Zoe Saldana), Scotty (Simon Pegg), Sulu (John Cho) and Chekov (the late Anton Yelchin). What was nice is that the supporting cast play there roles as homage to the original cast rather than dissolving into impersonations of the original cast, in short, everyone takes the role and makes it their own. We also get a nice appearence from the late Leonard Nimoy who plays his original role as Spock. Nimoy's Spock managed to avoid being erased from the original time line as he was pulled into the black hole. Everyone does a brilliant job in their roles and everyone is perfectly suited to their roles. This is a prime example of how brilliant something can be when the casting is just right. Abrams and screenwriters, Robert Orchi and Alex Kurtzman also deserve a lot of praise for pushing Star Trek into the minds of a new audience making the show popular again. The breathlessly move the story forward and give us time to get to know all our heroes. Again this is an example of something where everything falls brilliantly into place. It was nice to see that some things never change in that those officers who wear red are the ones who often die and the film contains a plot that only Star Trek could pull off. It is truly a warp ten adventure that boldly goes to somewhere new and proves that Star Trek will always be popular, no matter how much the audience's tastes might change!